In 1998, Peter Ward wrote three articles concerning brick & block making in Hemel Hempstead which were published in Chambersbury News, the parish Magazine for the team parish of Chambersbury ( Leverstock Green, Bennetts End & Apsley.) Although Leverstock Green was the principle area for brickmaking, the ridge of suitable clay spreads beyond to High Street Green and Cupid Green. These articles together with additional comments and supporting material are published below. If anyone has further information concerning the local brickfields and works, or photographs of any of the brickworks etc. please let me know as documentation seems to be very thin on the ground. The Dacorum Heritage Trust holds several examples of local bricks & tiles, and at the time of writing (Sept. 2001) an example of the local bricks can be seen on display in the foyer at the Leverstock Green Village Hall. The local bricks were a particularly pleasing deep marroon/red colour known as Leverstock Green Reds, and examples of property built locally out of these bricks can be seen some dating back to the 18th century. Hillside, on the corner of Leverstock Green Road and Green Lane is an excellent example of a Victorian home built from Leverstock Green Reds. The house was built for Mr. William Charles Child, who for many years owned the Bennetts End brickworks. He is known to have lived at Hillside from at least 1900 to 1933. He was also churchwarden for many years, and for a period of time Parish Clark..
Hillside, built from Leverstock Green Reds. It would seem that sometimes local brickfields were put to unofficial recreational use, and on one occasion at least there were tragic consequences. On a hot July day in 1897 five lads from Hemel Hempstead went out on a Sunday afternoon stroll up to Bennetts End Approaching Mr Norris's brickfield they decided to take a dip in one of the flooded clay pits, as they had done before. One of the youths, William Everett a general labourer aged 18, who could not swim, got into difficulties and drowned. He was the only son of widow Jane Everett of Queens Place, Hemel Hempstead (The Hemel Hempstead Advertiser). Malins Wood Brickfield, High Street Green, Hemel Hempstead, Herts. about a mile from Godwins Siding on the Midland Railway with easy access, good hard road to ,North West Railway and Grand Junction Canal Boxmoor, and only 5 miles from the City o St. Albans. Messrs Woodman & Son are favoured with instructions from Mr. Wm Ellingham to sell by auction at the above brickfield in convenient lots on Wednesday May 16 at 2 for 2.30 o'clock in the afternoon 130,000 brick, - comprising red bricks, second-v, greys, moulded bricks etc., also clearance large number of flowerpots, fancy vases and ridge tiles, etc..
Can be viewed and catalogues obtained of Mr William Ellingham, High Street Farm, of T F Woodman, Surveyor, St Albans, and of Auctioneers, Hemel Hempstead, Herts." The Kelly's Directory of 1890 lists Wm Ellingham, High Street Green, as a brickmaker. The map of the period does not show a Malins Wood, but 1 conclude this must be Maylands Wood, which was near the Wood Lane End brickfield. The High Street Green Farm presumably owned by Mr Ellingham was close by the water tower now at High Street Green. In the Cupid Green area between the water tower and Swallowdale Lane is Widmore Wood. It is open to the public. Near the entrance off High Street Green road is a largish pond and throughout the wood are many shallow pits, indicating that at some time it has been well worked for clay. "The History of Hemel Hempstead" records that when the roundabout near Swallowdale Lane was constructed the remains of a tile kiln was found. Perhaps it, was here rather than near Wood Lane End that the Saunders family made bricks. On the other side of Swallowdale Lane, bounded roughly by Redbourne Road on the west and north and by Three Cherry Trees Lane to the cast, was Claydales Brickworks, and it is so named on a 1922 map. The 1902 Kelly's Directory has an entry "Hemel Hempstead Brick and Tile Co., Brickmakers, Alexander Swinney". His home address was 30 George Street, but by 1906 he was at Eversfield, Alexander Road. Alex Swinney of 61 Newgate Street, Morpeth, described as an engineer, applied for a patent (No 18160) for an "Automatic Separating Tank for Brick Machine" in 1899, which was accepted in July 1900. 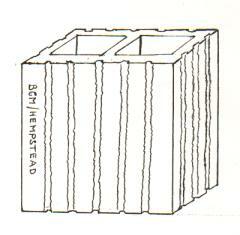 His application stated 'My invention has for its object the automatic separating of the rectangular blocks of damp clay after they have been pushed from the wire cutting table of a brickmaking machine, and the deposit of same on to a special pallet board ready to be dried without further handling." 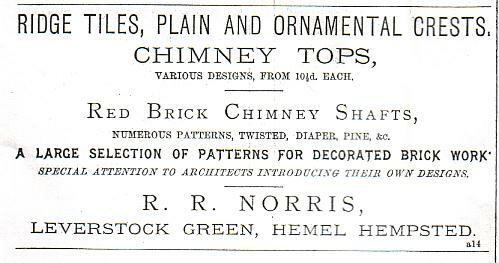 About 1907 the name of the firm changed from "Hemel Hempstead Brick and Tile Company" to "Hemel Hempstead Patent Brick Company" with Alex Swinney named as manager, and he was listed as such in the directories until 1917. Tom Mortimer joined the firm about 1913 and by 1922 had replaced Mr Swinney as manager. Claydales Cottages on the Redbourn Road are said to have been built just before the Great War, and it was there that Tom Mortimer and his family lived. His son Denis lived there at number one as a boy, and 1 am grateful to him for his recollections of brickmaking and blockmaking on the site. He recalls that at one time his sister and her husband, who was the kiln setter and burner, lived in the cottage next door. The pair of semi-detached cottages are still there opposite the entrance to the new adventure playground for Woodhall Farm, but boarded up. Tom Mortimer was born and brought up in West Bromwich. His father lost a leg in an industrial accident and Tom was obliged to leave school at eleven to help support the family. He found work at Hampstead Colliery Brickworks. His first job was clearing topsoil to expose the brickmaking clay. This was mixed with waste materials from the colliery to make bricks. In the early days the Claydales brickworks had made bricks and tiles of conventional type, but the change of name of the firm to "Patent Brick Company" came about when production switched to making hollow clay bricks (see diagram). The specimen in my possession, sadly broken, is 10 inches by 8 inches and 10 inches high, and along one edge is the impression BCM / HEMPSTEAD. The outer walls of the brick are about an inch thick. The hollow brick is open at top and bottom. They were made in a range of widths from about 3 inches to 1 0 inches. The outer sides were grooved to give better adhesion for plaster or cement, but some had plain faces so they could be decorated without further preparation. 1 am informed the blocks were made with a 1 0% admixture of sawdust to the clay, which reduced the amount of fuel needed to fire it. The blocks were slightly porous, reasonably soundproof, with good heat insulation. The machine for making the patent bricks was made bySwinney Bros of Morpeth and I understand the patent of the special brick was theirs. The manufacture of clay patent bricks ceased in 1948 when the New Towns Commission compulsorily purchased the works and land, approximately 52 acres, for £20,000. The clay pits were infilled by various contractors building roads in the New Town. About the same time in 1948/9 Tom Mortimer's son Denis, just after being demobilised from the army, began to manufacture clinker blocks on the site. At first he used two hand-operated machines from Winger of Rochester, the only type available at the time. Later he purchased two semi-automatic Tranco machines. The materials used were powerhouse clinker and cement, which bonded to-ether to produce a reasonably light block, so being made in Hemel the trade name Hemelite was adopted. In 1958 a minority interest in the firm was sold to C A E C Howard of Bedford, a company that was under contract to clear ash from a major powerhouse in Nottingham. About this time Denis Mortimer went to Frankfurt to see a Schallser fully automatic machine processing bomb damage material. One of these machines was installed at Claydales in 1959. When the blocks came off the machine they were put into Steaming Kilns for curing, a process which took only a few hours. At that time it was the most up-to-date blockmaking machine in the UK. The majority holding was sold to C A E C Howard in 1961. Hemelite went on to become the largest blockmaking company in the UK in its heyday. After the Second World War the use of the Hemel Hempstead to Harpenden Railway by passengers and goods traffic rapidly decreased, so that eventually Hemelite was the sole user transporting clinker via Harpenden to the plant. This was not a profitable operation for the railway authorities, so they offered the line to Hemelite, who accepted, and on 30 April 1968 it reopened as a private mineral railway operated by the C A E C Howard Group. Finally, a snippet for film buffs: in 1959 the MGM / Du Maurier-Guinness film The Scapegoat starring Bette Davis and Alec Guinness was released. Some of the scenes were shot at Claydales. I acknowledge with thanks the help of Denis Mortimer and the Dacoum Heritage Trust, also "The Nicky Line " by James and Hedley Cannon published by Barracuda Books as a useful source. 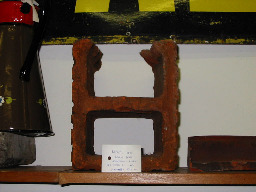 Left: Photograph of one of the Claydale blocks currently held at the Dacorum Heritage Store. The sites of brickfields to the east of Hemel Hempstead were located along the road from Leverstock Green to Cupid Green where suitable clays were available in sufficient quantities for commercial production. One such site was on the north side of Wood Lane End road. The ordnance map surveyed in 1877 shows the brickfield with two kilns, three clay pits and a large "old clay pit" to the north alongside Maylands Wood. I have written previously about this brickfield and its alleged connection with Charles Dickens. The History of Hemel Hempstead says the Saunders or Sanders family made bricks for several generations in the eighteenth century at High Street Green. Hemel Hempstead's first trade directory dated 1792 gave the name of only one brickmaker and that was John Saunders, described as farmer and brickmaker. Since the Wood Lane End brickfield was only about 500 yards from High Street Farm and High Street Green, perhaps at one time the Saunders family made bricks there. Bennetts End is a rather more fruitful area of research. The History of Hemel Hempstead states that there is a reference to Tile Kiln House in the Manor Court Rolls for 1603, and also that a brickmaker's inventory dated 1670 in the name of Thomas Edmonds of Bennetts End "still survives". He made both bricks and tiles using wood for fuel, and incidentally died heavily in debt. A map of 1922 shows that by that date the brickfields named as the Leverstock and Acorn Brick Works had extended north by some 200 yards, taking over the next field to what was then St Albans Road, the lower part of which today is St Albans Hill. The lane, which led off from the St Albans Road, provided access to the original brickfields, and Bennetts End House was in Tile Kiln Lane, which is today cut off by the dual carriageway. The old Brickmakers Arms which was once at the end of Tile Kiln Lane is now The Off Licence and The Drunks Cabin, isolated on the other side of the carriageway. Some of the cottages which were homes for brickmakers, now somewhat modernised, can still be seen in this part of Tile Kiln Lane. The longer section of today's Tile Kiln Lane then as now led to Leverstock Green. An advertisement of 1922 named Richard A Norris as Managing director of the Leverstock and Acorn Red Brick Company Limited. He was residing at Berkhamsted. The firm was described as manufacturers of red and grey facing bricks and all descriptions of moulded bricks and brickwork ornament. there was no mention of tiles. A later advertisement stated the firm was established in 1848. In September 1922 The Hemel Hempstead Gazette reported a visit of the Geologists Association to view certain geological features in the neighbourhood. The first call was to the "recently opened" flooded gravel pit by Railway Terrace, Kings Langley, where the gravel was extracted by suction pump. The party was met by Mr L A Daniels, who shows them the remains of prehistoric animals there. Then they went on to Bedmond to view glacial deposits, then to the Acorn Brickworks, Bennetts End, where Mr Norris showed them round the various claypits, drawing attention to the different types of clay. After tea at the works they finished the visit by seeing a clay pit on the premises of Pemsel and Wilson, motor engineers, on the London Road, Boxmoor. In the Dacorum Heritage Trust store at Berkhamsted is a bronze pin found at the Acorn Brickworks. A letter dated 18 November 1930 to Mr R A Norris from the Geological Survey and Museum, Jermyn Street, London, stated that the British Museum had dated it about 1500. A note on the reverse of the letter records that the pin was found five feet below the surface by Mr G M Norris in 188 1. The pin is 95 mm overall in length with a more or less spherical head about 6 mm in diameter on which is a rather worn human face. The pin tapers from approximately 2 mm down to 1 mm. It would appear the S of Hempstead was missing from the mould when it was made. 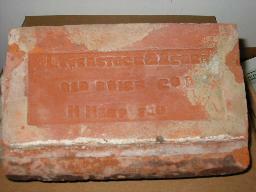 On the other side of the brick is "110", presumably the mould number. It may be that this brick was produced before Acorn was incorporated in the firm's name and judging from the spelling of Hempstead, perhaps before the end of last century - or was it just a mistake! 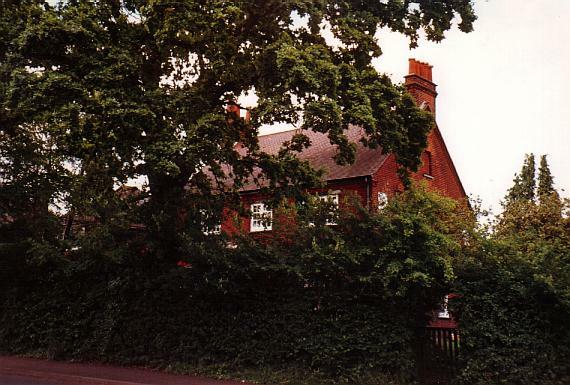 When the chimneystack of houses 151 and 153 London Road, Apsley End, built in 1897 was removed for repair the plain red bricks were found to be from the Bennetts End brickfield. They had the imprint "L & A", i.e. Leverstock and Acorn, There were also decorative bricks of four different patterns. They all had mould or pattern numbers on them. Only one had another imprint, which was H. HEMP. The last entry advertising the Leverstock and Acorn Brickworks appeared in the Herts. & Essex Directory of 1944/5. It would seem that the business ceased shortly after that. This would coincide with the acquisition of land for New Town development. Although there are few physical traces of the brickfield on the ground today, there is an abundance of street names such as Brickmakers Lane, Brickfield Avenue, Kiln Ground (roughly the site of the tile works), Tile Kiln Crescent and, commemorating the firm, which produced bricks at Bennetts End for about one hundred years, Acorn Road. Some brick markings taken by Peter Ward. Just after 1 had written "Some Local Brickfields" for Chambersbury News, Barbara Chapman kindly to me some relevant information which she had recently found while perusing copies of the Hemel Hempstead Gazette for 1905. This was about the brickfields at Wood Lane End, Hemel Hempstead. 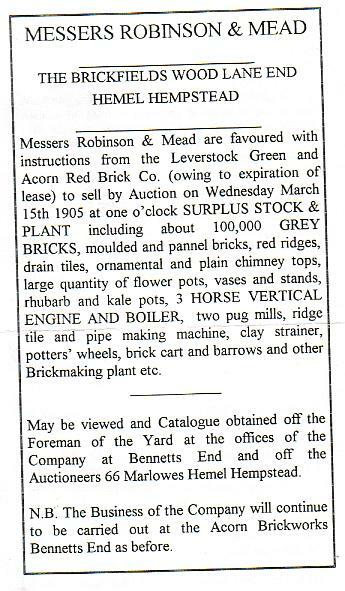 An advertisement by Robinson & Mead, auctioneers of 66 Marlowes, appeared weekly from 1 February to 1 March, to the effect that they had received instructions from the Leverstock Green and Acorn Red Brick Company to sell by auction on 15 March surplus stock and plant due to the expiry of the lease. The list of items for sale is most interesting because it reveals that not only bricks were made at Wood Lane End, but a wide range of pottery items too. The various lots to be offered for sale included 1 00,000 grey bricks, moulded and panel bricks, red ridges, drain tiles, ornamental and plain chimney tops, flower pots, vases and stands, rhubarb and kale pots. Machinery was also to be put under the hammer: a three horse-power vertical engine and boiler, two pug mills (machines for mixing clay with water), a ridge and pipe making machine, a clay strainer, a potter's wheel, a brick cart and barrows, and other brickmaking plant. These adverts appeared in the Hemel Hempstead Gazette from February 11th 1905 to March 11th 1905 (ABOVE); 6th May 1905 (ABOVE RIGHT); March 18th 1905 (BELOW LEFT)and 20th May 1905 (BELOW RIGHT) respectively. A footnote to the advertisement said the business of the company would continue to be carried out at the Acorn Brickworks at Bennetts End as before. This information alters the impression 1 had previously formed that the Wood Lane End brickfield was entirely separate from the Bennetts End brickfield, which 1 had regarded as the Leverstock Green and Acorn. Without further facts it seems to me that the Wood Lane End operation was the "Leverstock (Green)" part of the company and Bennetts End was the "Acorn". This view is supported to some extent by a report in 1876 of a visit by Sir John Evans of Nash Mills and members of the Hertfordshire Natural History Society to the Bennetts End brickfield, which was named simply as the "Acorn brickworks". 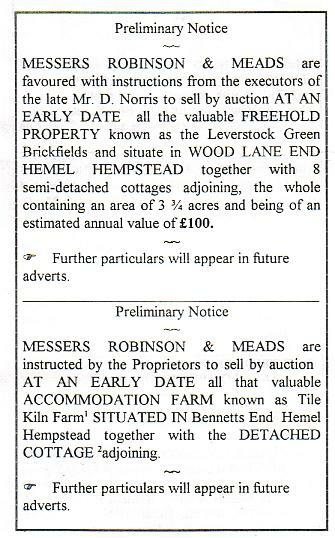 The Hemel Hempstead Gazette of 6 May 1905 carried two preliminary notices of further sales by Robinson & Mead. They had received instructions from the executors of the late Mr D Norris to sell the freehold property known as Leverstock Green Brickfields in Wood Lane End together with eight semi-detached cottages adjoining, all in a 3 ¾ acre site. These apparently were the cottages with the alleged Dickens connection (see his novel "Bleak House" and entry for 1852 in Leverstock Green Chronicle). Also they had instructions from the proprietors to sell the accommodation farm known as Tile Kiln Farm at Bennetts End, together with the adjoining cottage. The cottage now located at the junction of Tile Kiln Lane with Caro Lane is today a Grade II listed building. An advertisement two weeks later gave further details, describing the Wood Lane End property as Leverstock Green Brickfields and Potteries, with foreman's house, stabling, kilns and other buildings, and suggested it would be very suitable for use as a fruit or poultry farm, accommodation purposes or the occupation of a dealer. It was suggested Tile Kiln Farm at Bennetts End, within 32 the acres, well timbered and with good views, would be suitable as a gentleman's residence. There was a large and interested company at the Kings Arms Hemel Hempstead on Thursday on the occasion of an important sale by Messers Robinson & Mead. In a few introductory remarks the auctioneer (Mr. 1. G. Mead) who was selling in conjunction with Messers Spain & Sons observed that the property had been in the occupation of the Leverstock Green & Acorn Red Brick Co. whose lease was expiring. He felt certain that the premises could be quickly let, the situation being so near to the town of Hemel Hempstead and just the sort of property to suit a man who wanted small holding. The first lot introduced was the land foreman's house and building known as the Leverstock Green Brickfields and Potteries situated in Wood Lane End Hemel Hempstead. The property had considerable frontage to Wood Lane End and contains an area of 3 acres. Lot two contains an area of V2 acre and of an estimated annual value of £20 per annum. The whole was first put up on one lot and was started at £500. Biddings advances steadily to £8 1 0 at which ridiculously small figure the whole was knocked down to Mr, Gentle of St. Albans. Mr. Mead then submitted the very desirable accommodation farm known as Tile Kiln Farm situated in Bennetts End and containing an area of 52a. 3r. 37p together with the homestead. Bidding commenced at £ 1000 and increased to £ 1400 by bids of £ 100. Then smaller sums took the price to £ 1 500 when the auctioneer decided to add the next lot with it. This consisted of a detached cottage adjoining lot one with large productive garden. The whole was then started at £1 525 and then rose to £17500. Mr. J. K. Hart of Leverstock Green becoming the purchaser at this figure. A reference to a brickmaker at Bennetts End was made in the Gazette in 1927 by George Eyles, who often contributed his reminiscences. He stated that "all the red houses at Albion Place" in Lower Marlowes from the Albion Mill down to the Plough Public House were all built before his time by Mr Franklin, owner of Bennetts End Brickyard. (The Albion Mill was next to the Midland Railway Bridge across Lower Marlowes,) Kelly's Directory for 1850 describes Thomas Franklin as brickmaker and farmer at Bennetts End. As there is a reference to the Leverstock & Acorn Brick Company being founded in 1848, perhaps he was the founder or a co-founder. Viviane J M Bryant, in her book "A History of Potten End' published in 1986, writes about pottery-making and brickmaking in the village. The main brickfield was roughly north-cast of the junction of Little Heath Lane with Hempstead Lane, and was bounded on the south side by Hempstead Lane. This was operated by John Nash and son in the nineteenth century. A short distance away on Little Heath was another brickfield which was owned by Daniel Norris, who lived at Lower Mill Berkhamsted, and, states Ms Bryant, he owned another brickfield at Leverstock Green. it is her estimate that all brickmaking at Potten End had ceased before 1900. Further examination of bricks from the house in London Road Apsley (see Chambersbury News May 1998) has turned up a brick with the inscription NORRIS H. HEMPSTEAD, providing a fitting commemoration of a name connected with local brickmaking for well over half a century. 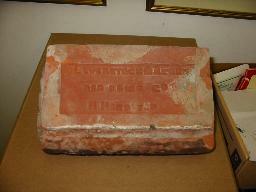 This and other bricks have now been deposited with the Dacorum Museum Trust. Many thanks to Barbara Chapman who has supplied most of the information for this article. N.B. To search for a word or name on this page, click on Edit, then Find on your browser toolbar. “The Leverstock Green & Acorn Red Brick Co were summoned, that being occupiers of a certain factory, they neglected to secure and make safe certain mill gear, and that as a consequence, William Henry Brigginshaw came by his death. There was a second summons that shafting was unfenced. Co pleaded not guilty………. …Believed to be the first accident of many years, since he believed the opening of the factory in 1888………there was no suggestion of wilful neglect – because of the “very fair opening by Mr Dymock (HM Inspector of factories) plea of guilty withdrawn and “guilty” pleas replaced it. Mr Dymock had visited the works on April 7th following a phone call. He had seen Mr R A Norris the managing Director, and was shown the machine room – Mr Dymock reporting in considerable detail what was found there, nothing having been touched since the accident bar removing Mr Brigginshaw's body. Mr Brigginshaw had been a valued employee, and it was reported that many engineers, companies and even inspectors didn’t consider such conditions dangerous Many verbal warnings had been given not to touch shafting while it was working. The Company had had over 25 inspections, which it had passed, and there had been no complaints.